Baby Thun and I went through a bit of a tough patch recently. Because of all the stuff going on right now – dairy cow auctions, my exams coming up (I passed my last math exam with an A when I was expecting a D, go figure), the biomechanics lecture – I haven’t been able to spend as much time with him as I like. I wish I would work all of my horses 6 days a week. Thun especially would just thrive on that. Maybe in summer… but right now, it’s not 100% possible. The problem in only 2-3 days a week lay not in the horse’s behaviour (Thun always tries his heart out) but in my feelings of guilt. C’mon, guys, he comes running up anytime I come near the place with a bridle and then stands hopefully near the fence in case I work with him instead of Arwen. What kind of a stone heart can not feel guilty? Unfortunately, it creeps into my feelings when I do ride him and that messes with our minds because Thunder hates me being down and responds by also being down. This results in him being a lazy little mule and refusing to pick up the right leads. I decided that we’d had enough of that kind of thing and gave us both a pep talk before our session on Monday, which turned out to be entirely awesome. The dressage whip I carried to give him a little reminder about leg aids probably had something to do with it, but I was in a better place in my own head and that always helps. We just schooled, but he was so awesome. I’ve said it before and I’ll say it again – that little dude has the most willing mind ever. Sure, he can be a twerp about some things (like reining back. I can get him to back as far as I please on the long lines, but under saddle? 5 steps) but working with him is just a general pleasure because he really does try his best. He’s basically a nice, dependable guy. Young, occasionally spooky, not the brightest of horses and possessing the attention span of a gnat, but on the bottom just a good, honest horse. Not a spiteful bone in his body. One thing that makes him super easy to work with is that if he was any more relaxed he’d be horizontal. 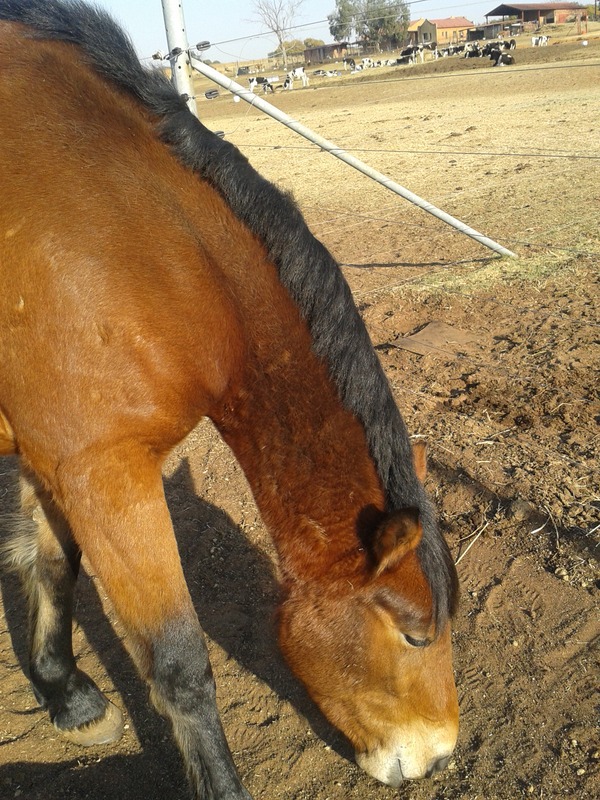 His head goes down all by itself, his trot turns into a job all by itself, and he lopes in balance all by himself because he’s chilled and trusting. Our sessions rarely last longer than 20 minutes in the arena because his baby brain cooks very quickly, but it’s a good 20 minutes. 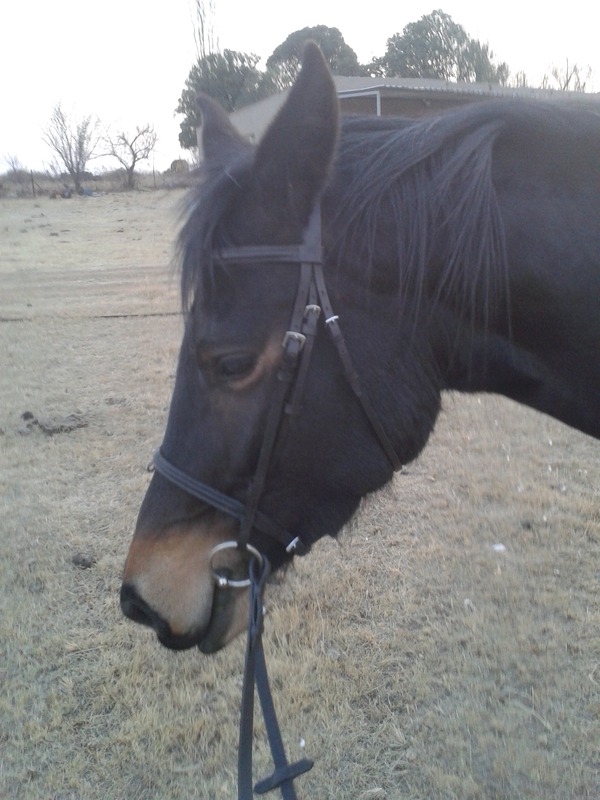 He gave me some great lead changes, good steady jog work and the best neck-reining I’ve had from him – a six-loop jog serpentine without once touching his mouth, and a few nice lope circles without direct reining. I’ve seen a lot of Western horses in South Africa that have been ridden on a loose rein so much that they actually have no idea what the bit means and will resist it as much as they can, usually by opening their mouths and bracing their necks. I’ve worked hard with Thunder to get him to accept the bit, and I must say it is a nice change to pull a Western horse to a halt and have him softly yield the jaw and lift the back instead of collapse in a heap with his face in the air. Thunder will go into a contact in a good frame as happily as he will go on a floppy rein, and while that might be a bit controversial in Western circles, I count it a small triumph. Oooooold and very loyal readers may remember Thunder’s half-sister, Dancer, from the old blog about two years ago. Dancer is Arwen’s daughter by Thunder’s dad, born in the same year as Thunder. They grew up together, but I was overrun with horses and sold her when she was about two. I had the pleasure of going to see D in her new home today and I was pleasantly surprised. She has grown up quite big – about 15.1, maybe touching 15.2 – and has some really nice movement on her. Although she hadn’t been ridden for two months and has barely been backed, I got on her and got walk, trot and a few strides of canter with no silliness. She’s also remembered all the good ground manners I taught her as a foal, and is doing very well. I was so happy to see D. She gave me a few grey hairs while I was schooling her and has a mischievous streak, but she’s behaving herself for her new people and turned out to be a really nice young lady. I do wonder, now, what she would be like if I had her now and was schooling her as a dressage prospect; she would probably have turned out pretty good. Still, I don’t regret selling her. I can devote more time to the horses I have left now, and to horses, love is spelled T-I-M-E.
And I serve the King of Kings, so it’s all about love. I’m currently working with a horse that was started western… I use to ride western all the time, but I haven’t in so long. I’ve really gotten spoiled with how responsive english/dressage horses are!!! It does feel so much easier to get a response when you actually have something on the end of the reins, doesn’t it? Thunder was actually started English and then brought on Western, which works out well because he’ll respond to direct reining and so on as well. Ugh, I’ve ridden some of those real kick-and-pull Western horses and they are really not very cool! My sympathy! He is! 🙂 Just wait till he gets a summer coat and his mane grows all the way out and he’ll be a stunner!